Longtime Ohio college basketball coach Dan Peters has taken a medical leave of absence from his job as Akron's director of basketball operations as he battles pancreatic cancer. Longtime Ohio college basketball coach Dan Peters has taken a medical leave of absence from his job as Akron’s director of basketball operations as he battles pancreatic cancer. 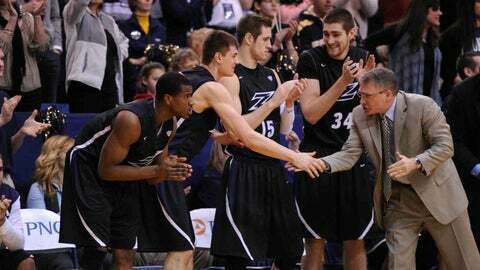 The Akron program announced Peters’ absence and his sickness in a press release last Saturday. On Monday, Peters was scheduled to undergo surgery. Though his is a private battle, Akron coach Keith Dambrot said Peters will have plenty of public support. “He got the diagnosis in (early December) and immediately talked about how he’s going to battle it,” Dambrot said. “It’s hard because our guys like him. It’s sad. He’s been coaching a long time, made a lot of great relationships. Peters is a former head coach at Walsh College and Youngstown State, and a former assistant at Cincinnati and Ohio State. He’s in his fifth season at Akron, and Dambrot said Peters had pegged this one to be his last as he eyed an August retirement. His role as director of basketball operations involves logistics, scheduling and travel, but his experience having been in the head coach’s seat is more valuable to Dambrot than anything that shows up on Peters’ bio. The Zips will wear a patch wil a purple ribbon and the phrase “4 Pete’s Sake” on their jerseys for the rest of the season. Peters was on Thad Matta’s staff for Matta’s first three years at Ohio State, including the 2007 national runner-up season. His son, Danny, played at Ohio State and is now a graduate assistant at Arizona. Peters succeeded Bob Huggins as the head coach at Walsh College in 1984 and was there five years before moving on to to become an assistant at Western Carolina and Akron, and then became head coach at Youngstown State in 1993. He worked for Huggins again at Cincinnati from 1999-2004, the last two seasons as associate head coach. Peters is a native of Canton, Ohio and a 1976 graduate of Kent State.